I spent a day last week updating the 'Workshops' section of my website. This included finding more student photographs from the last year's travels. It was fun to visit with my students again as I looked through my photos. I was welcomed so nicely by everyone and some great projects and designs were created. I also added a new workshop. Improvisational Curves resulted from a pattern I designed using Northcott's Shimmer fabrics. 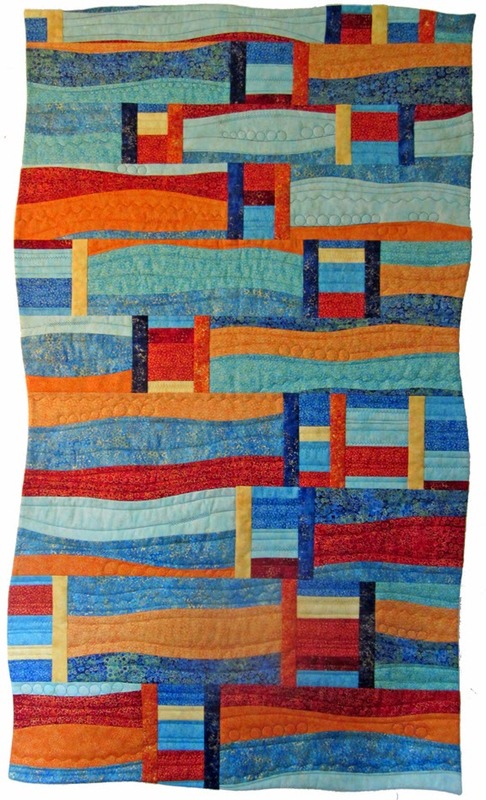 I had a design in my mind and used Electric Quilt design software to see what it might look like. Here is the EQ image I started with. I didn't like the straight edges of the design so knew right away that I would cut a curved edge for this piece. I couldn't figure out how to do that in EQ so just forged ahead and made the quilt. Then I cut the curve edge and used a modified 'pillow-case' method to add the backing to the quilt. As I worked on the quilt I developed a way to cut the curved pieces in stacks so they could be swapped to get the curve fabric to use in my design. And here is the final quilt and a table runner made from the sections leftover from the quilt. I tested the method again and made this runner too. Come back later this week to see an additional design for my Ripless Paper Piecing workshop. My 2016 teaching and travel Schedule has also been updated. I'll be in Lethbridge, Alberta in April and O'Fallon, Illinois (near St. Louis) in June. If you are in either of those areas and would like to schedule a lecture and workshop, contact me and we can work out details.